Discover the best stories of proud Datsun owners. So when I just got a new car, I wanted to test it driving across the hilly road. From Tangerang district to Dieng, Wonosobo. On the highway, it was a smooth ride. But when there were two route options through different terrains, my friends and I had a discussion. Route 1 is a nice road but farther, while the route 2 had a shorter distance but heavier terrain; with slopes and rocky ground, which was also slippery due to rain. Finally my friends and I chose the route 2, "Might as well test the new car," hehehe. When going through a very steep slope, the five of us in the car was worried that the Datsun wouldn’t make it. But thank God, in every slope, bend and rocky road, Datsun ran smoothly, safely and comfortably. The second leg of our homecoming trip from Jakarta to Yogyakarta in 2015 is Cirebon-Yogyakarta on D+1. After enjoying loenpia Semarang for old time’s sake, Goples, that was how I call my Datsun Go+ Panca, was headed towards Tembalang -Bawen toll road with one mission; to test the torque! Out of the toll booth, accompanied by the view of Semarang-Ungaran hills, the car’s engine was revved to the max to climb, without compromise. In my personal opinion, the steepness of this toll was even greater than Cipularang, which I wasalready familiar with the terrain and the gear-shifting strategy. Usually I tended to be an eco-driver. But this time, being less confident than usual (because normally in this situation I would be using a European sedan with a capacity of 3 liters), eco-driving was put aside for a moment. But what happened next, instead of being underpower, I actually enjoyed every burst of energy, burned by the RON 92 fuel. In such extreme inclination Goples was effortlessly running under the speed limit allowed, trooped along an SUV turbodiesel engine with torque more than 300 Nm! Let’s Go Mudik Lebaran With Datsun! Mudik Lebaran is an annual tradition, when people who live in big cities take a road trip to their hometown to celebrate Idul Fitri (Lebaran).This year, the time had come and our whole family was ready for Mudik. We had been doing it for years, but this time it felt different with Datsun GO+ Panca. Firstly, the size was a perfect fit for our family of six. And there was no problem regarding luggage bags and suitcases, as our Datsun GO+ Panca was equipped with a roof rack. Mudik with Datsun GO+ Panca was very cost efficient, because even with the fuel prices hike at that time, it did not affect the total cost significantly. Awesome, wasn’t it? We departed from Bandung city, off to the North Coast of Java Island, passing through the area with hilly topography. 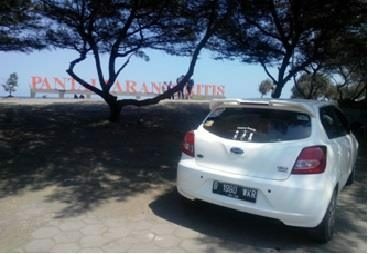 The car’s performance remained good and comfortable up until Cirebon, where we crossed the Kanci road. We took a break in the rest area with a Nissan - Datsun check point. We enjoyed our coffe while our car was being checked. It turned out well, there was no problem. We just made sure the tire pressure was right. Afterwards, we continued the journey along the North Coast. The journey was even more pleasant as the road is straight without many slopes and turns. The air-conditioning was quite cool, even in the middle of coastal area heat. We all felt comfortable, unlike our previous Mudik experiences. Once again we stopped at a Nissan-Datsun check point, this time in the Alas Roban region, Central Java. Just like before, we enjoyed the coffee and snacks provided while waiting for the car to be checked. Once again, no problem, so we just checked the tire pressure. Thank God, finally we reached our destination in Pati. It didn’t feel like we just drove a 500 km distance. We stopped at a gas station, eventhough the fuel gauge indicated that there was still some gas left. It took only 27 liter of gas to fill up the tank again. Datsun GO+ Panca was definitely very economical. Afterwards, we shared our travel experience with our relatives. Thank you Datsun! Hey, it’s Bailina again here. 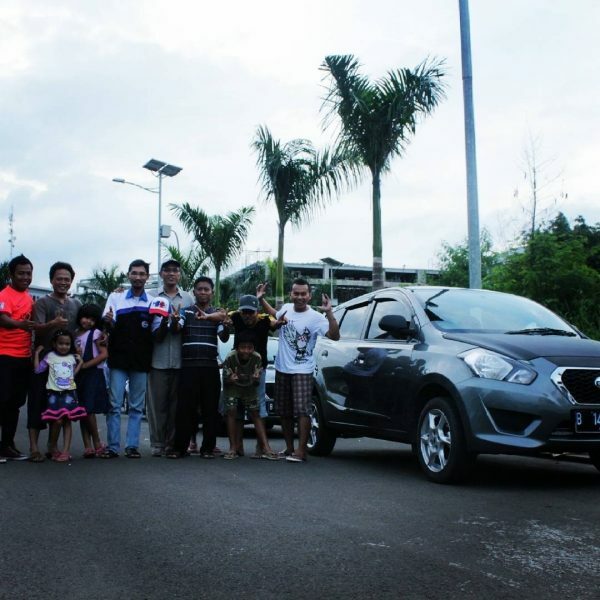 After the trip to Ujung Kulon, our family was closer than ever thanks to Bronzee; our reliable Datsun GO+ PANCA. Not only that, we also found a new way to make more quality time. Although we were always busy with our jobs on weekdays, now with Bronzee, we can have family times on weekends and holidays. Here is one of the stories. "Where do we go next, Beh? The long weekend is coming soon!" I said to Abeh, my husband. As usual, he didn’t answer that simple question with words. However, he always seemed to have the same ideas and feelings as mine about our family bonding. Without a word, Abeh always gave us fond memories, together with Bronzee. "How about Borobudur?" said Abeh. "What, Jogja? Are you serious?" I said hesitantly, but excitedly. Because I knew, the long trip would definitely be a memorable moment for our family. "Let’s go, let’s go, Beh!! When?” I asked. "Tomorrow. Let’s invite Teh Elis and her family too," Abeh answered. Without wasting time, I called Elis Jazilah, my sister. I invited her for a road trip with Bronzee to Borobudur. She accepted. 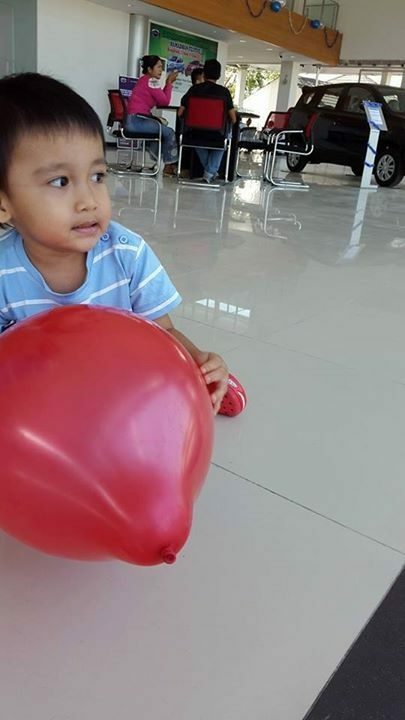 So, one day before Christmas, Teh Elis, Bang Dunih (my sister's husband), Abdan (6 years) and Moza (2 years) Abeh, Kun Athira and Kun Shahzad and I, left for Yogyakarta. Initially I was hesitant to take this trip. Because the distance seemed really far to me, who had never been on a private vehicle to Yogyakarta. Besides, could eight people fit in this small Datsun car? But, for the sake of sharing the happiness and spending a quality time with my sister’s family, I made up my mind to go to Jogja. The night of December 24, 2014, we took off. Gee, I was really surprised; this tiny Datsun turned out to be very comfortable for 8 people. My family of four was sitting in the front row, while Teh Elis, Bang Dunih, Abdan and Moza sat in the second row. Bronzee’s third row was filled with our luggage: suitcases, bags, and other things. I have been using datsun go from feb 2015 and drove it for 22000 km in 7 months.. I want to say that it is an amazing experience of owning a datsun go car.. Superb pick up and car can run at higher gear on low speed too.. its smooth on roads its my love to be near this car even . Just best wishes for new owners. We own a Datsun GO since Christmas 2014 in the family. My brother had purchased the Grey colored Datsun Go. It so happened that we got a Red colored Honda City around the Republic Day of 2015. My 4-yr old daughter, Ashmi, identifies the 2 cars as the "Grey Car" and the "Red Car". During her summer vacations, she used to go for hobby classes and my wife used to pick-drop her from the school. My wife is very comfortable driving the Datsun GO. And my daughter was always saying "I am going to school/home in the Grey Car". One day, the "Red Car" was at home, and my wife took the car to pick up Ashmi. The moment, they left school, Ashmi asks "Mumma, why did you not bring the Grey Car ?". My wife replied, she wanted to drive the "Red Car". Ashmi, immediately retorts back, "Grey Car ka AC better hai. I am feeling hot in the red car. Aap kal se Grey Car hi lekar aana. Running Out of Gas? No Way. Blip, blip, blip. The fuel gauge on Goples, the nickname of my trusted Datsun GO+ Panca, was indicating that the gas would only suffice for 2km. There was not a single gas station throughout the journey from Joglo to Senayan.. But, a bit recklessly, I kept driving my Goples to attend a marine festival at Senayan with my friends. Finally with minimum gasoline, I arrived at the GBK (Gelora Bung Karno), Senayan. Panic appeared later when I was leaving GBK. Understandable, as I was not familiar with the streets of Jakarta. Blip, blip, blip, the fuel gauge showed lines only, and no indicator of how far more the gas would last. The blip, blip, blip of the gas indicator has now lost to the thump, thump, thump of my heartbeat. "Oh no... Will I ever get to the gas station?" Panic. I drove along the Patal Senayan road, asking people every now and then, but... "Why would there be a gas station around here?" said a residential security guard whom I asked. I tried my luck in Arteri Permata Hijau. Goples had already been running for more than 2km, and still not a single gas station in sight. Then I remembered, there was a gas station in the Kebayoran area, about 2km away from Arteri Permata Hijau. Desperately, I drove Goples along the Arteri Permata Hijau to Arteri Pondok Indah. Thump, thump, thump... It was crazy; the traffic was really bad! I saw that the fuel gauge did not change. I couldn't tell how far more I could go with the remaining gasoline. I grew even more desperate. But, hey...! Surprisingly I had been driving for 6-7km in heavy traffic from GBK to Kebayoran. Eventually a gas station appeared right before my eyes. That was great; as Goples had almost made me hopeless. But knowing that Goples was super economical, I was no longer worried about running out of gas. Right away at the gas station, I filled Goples' gas tank full. "Almost Run Out of Gasoline with Goples, What Would The World Say?" I survived this time; the super economical once again proved his strength. Awesome! 2km of gas was able to stretch into more than 14km in a traffic jam. Either I was lucky, or Goples is indeed super economical. But most importantly, I got home safe and sound without running out of gas. After spending some time to research on Internet forums, finally I had decided on Datsun GO+ Panca as my first car. 1200 cc engine, three-row seats, eco indicator, immobilizer, parking sensors, MID indicator: wow, the sophisticated technology makes Goplus a great value for money. You can call it the most luxurious yet reasonable in its class. Even some automotive observers deem it comparable with another MPV brand that costs far above Datsun. A week before my car arrived, I took a driving lesson and the exam to get a license. When I finally got the vehicle registration and my driver's license, I took my wife for a trip from Jakarta to Bandung. That wa my first experience driving out of town. It was fun to enjoy the cool Bandung air. Next, we went to Yogyakarta to show the car off to my in-laws, hehe. My family in Jambi didn’t know I owned a car. No need to tell them; I’d just suprise them when I go back home. Then, a month later: my wife and I were already in the highway at 5 am, heading to Merak seaport to cross to Bakauheni, Lampung. I was told, the ideal time to cross was 7am. Unbelievably, the trip from Kemayoran to Merak only caused the fuel gauge to go down one bar; it was incredibly efficient! Because we got the standard R13 alloy wheels, passing through the streets in Lampung with huge potholes was not an easy task. I, who just recently learned to drive, was forced to maneuver here and there. 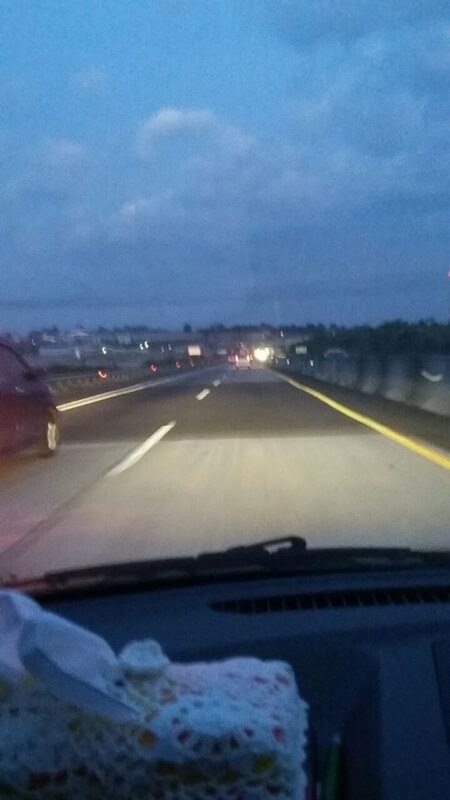 Even on seemingly smooth, long road, suddenly there are 4 or 5 meters of badly damaged sections. So we became familiar with the friction sound of my bumper and asphalt because I didn’t hit the brake soon enough. Forgive me please, Datsun bumper, hahaha. As a marketer, motorcycle has become a friend to take me anywhere. Like a mandatory tagline for marketers; UNDER THE HEAT WE GET HOT, UNDER THE RAIN WE GET WET. The sweat stink on a hot day, the damp jacket and wet sock smells on rainy day, and the always-limp hair from wearing helmet ... hahaha. Quite off-putting, isn’t it? Especially for a marketer who constantly needs to meet prospective customer. Besides work, I also help my mother’s business. Taboh Dietary Catering; a healthy food catering which has been running for a year. Once there was an unforgettable story when I took a day off from work. We got an order; 60 servings of fruit salad, to be delivered to 15 different addresses. When the salad was ready and delivery time came, suddenly it was raining heavily, The only option was going through the rain with a motorcycle wearing a raincoat, and covering the salads with a plastic sheet. In the end… 5 portions went undelivered, and the next day I was sick. In summers, my hands got tan lines from the sun. Those were the things that fueled my dream to have a car. As a marketer, a car would help me to stay fresh, my hair kept neat and I become more confident in front of customers. And for the catering business, a car would help me to deliver the orders on time. Most importantly, a car will protect me from all kinds of weather, hehehehe. Since a marketer’s salary was not very high, the right option for me is an LCGC car. 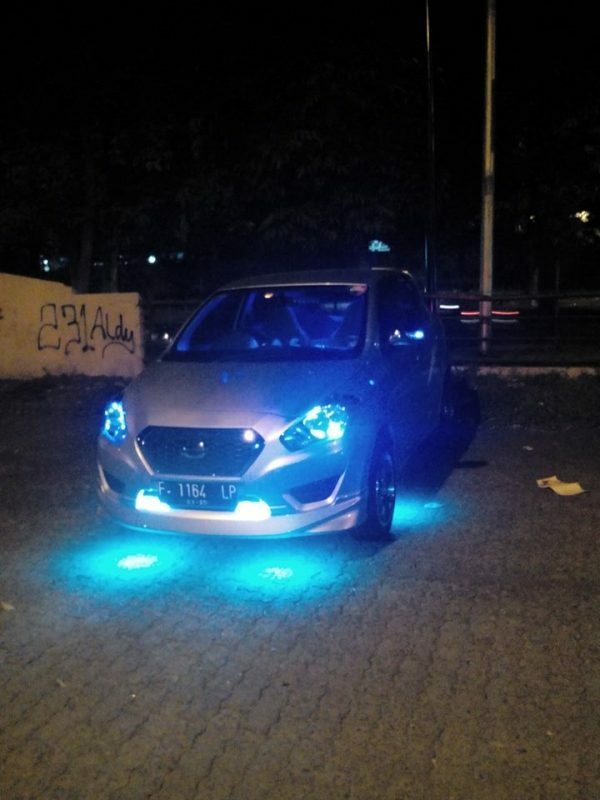 Well, out of many LCGC cars, Datsun Go Panca had caught my interest from the beginning. The sporty body shape which looked coolest among other LCGC cars, and also the great features, has made me more comfortable and confident. The roomy luggage was also handy for catering delivery. Afterall, Datsun was a well-known brand. A dream has come true. 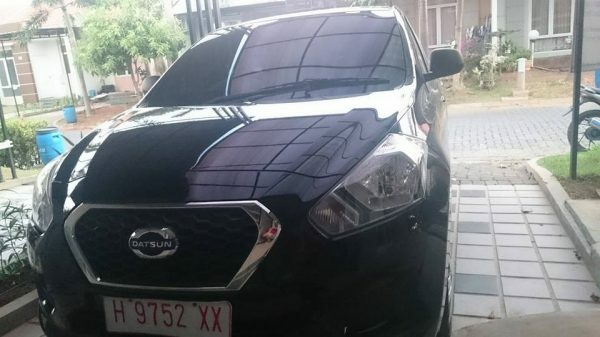 A black Datsun Go Panca T Option was the ultimate choice to inhabit my garage since August 14, 2015. In the future, we are planning to sell fruit salad and cheesy wings with Datsun every weekend at hip locations. Hopefully that will help me to pay the installments. Datsun also makes it easier for me to go out and find materials for my culinary blog, @lampungkuliner. Datsun was my first car and my dream car, which would help me to realize my other dreams one by one. Amen. Datsun is our family’s first car. It brought us unforgettable moments when we took the trip to visit Grandma’s house in Magetan, East Java for mudik Lebaran 2015. What was our plan for a car that departed in the afternoon from Situbondo to Magetan, traveling a distance of about 350 km, in order to bring 5 people comfortably, plus a lot of luggage? We had two small children and the youngest one was still a baby, so we made a small wooden bench as a separator on second row so that it can be used as a bed, and it would let the children to sleep more comfortably during the evening trip, while the baby would be held by my wife. The third row was full with our luggage. On D-Day, a bed had been prepared, and wow… both our children was amazed, they yelled excitedly and immediately scrambled to occupy the space on the second row. My wife and baby sat in front beside me; the driver. In the afternoon, left the house and a moment later, the children were already sleeping soundly (the AC was blasted and the children were tired from the lack of sleep during the day). That evening we rode in silence, only stopping for dinner and filling the gas tank. Finally, we arrived safely at Grandma's house around 1 am. The next memorable moment was the trip home from Grandma's house back to Situbondo after the Eid holiday. Can you guess why? Yes, we had to bring a lot more goods such as rice, onions and other crops from Grandma’s field. Everything fit into the third row baggage, with some other items placed on the sides of the wooden bench and under the seat. On the way home, we stopped by at Waterboom park for a refreshing break from the trip. We left in the morning and got home in Situbondo in the late afternoon. Our journey with Datsun car was done without hurry. Six days of work has passed. Today, Sunday, the sun is shining so bright. I see our favorite car parked in front of the house. Our quite luxurious first car, white metallic Datsun GO+ Panca. 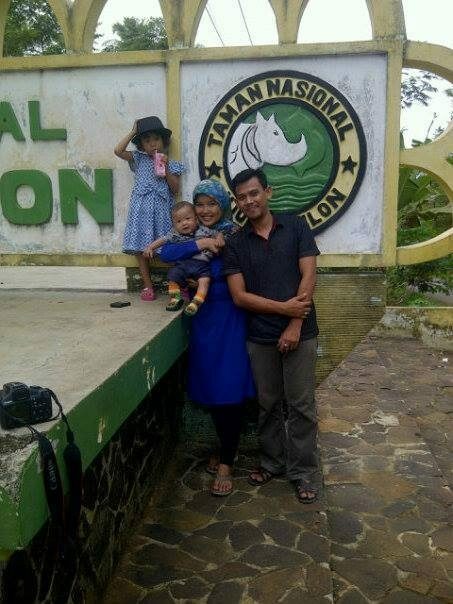 That day I planned to take my family for a trip to Rancabuaya Beach, a natural attraction in South Garut region which never failed to amaze its visitors. It was the perfect time and place to test Datsun GO+ Panca traveling in the wild. We started packing for the journey. All of the essential supplies were ready. The rearmost seats are folded to accommodate more luggage. 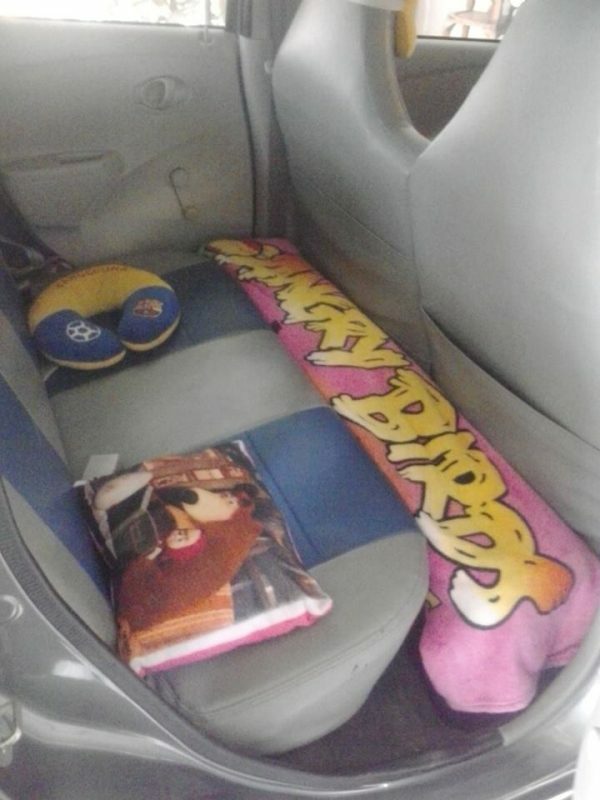 Both of our children looked very happy; they were sitting comfortably in the middle seat. My wife sat beside me in the front seat. The clock struck 07:15 am. I asked them to pray for a smooth and safe travel. Afterwards, we were driving on the toll road. On the straights, bends, declines or inclines, everything was passed without a hitch. Halfway of the trip, we took a break for refreshments. We were having tasty food and fresh, nutritious drink while enjoying the beach scenery along the southern ring road lanes. At 10.00 am we arrived at the Ranca Buaya beach. The blue sea and its crashing waves welcomed us. Our children got off the car immediately. They brought their fishing gear along. Between the coral reef, where the sea water was trapped, there were a lot of small fish of different colors. The children laughed while trying to capture the incredibly energetic fish. To be able to catch them, a good strategy and extra patience would be needed. Really, this was an incredible experience. The hot, humid air made us want to stay in the water for as long as possible. My wife ordered young coconut drinks from a nearby stall to quench our thirst. After we were done playing, the Ranca Buaya’s signature grilled and fried seafood dishes, with chili sauce and fresh vegetables, were already available. Wow, such tasty and appetizing food. We polished them off in no time. As a dessert, we had rujak ulek (crushed fruit salad). Hmmm... Such an incredible pleasure. When the horizon was turning violet and the seagulls were returning to their nest, we were also packing up to go home. Our trusted Datsun GO+ Panca was ready to take us home. During the smooth journey, the combination of soft music and the cool blast of air conditioning lulled the children to sleep soundly. It was truly an unforgettable trip. My Datsun Go+ met all requirements Be it low Budget, Spacious, Seven Seater, Nice interiors, good mileage. MY kids always wanted separate seat for them, for a family members with 4 Adults and 2 kids its a perfect car for us. Interestingly I went to Datsun show room to See Datsun Go for my friend but when I saw Datsun GO+ it was love at 1st Sight for me. Bought it on 18th July now a happy Datsunite. Its First Datsun Go+ of my City Belgaum Karnataka. I am from a small town in the East of Java island, in Jember to be exact. Around 2013, I saw an ad for Datsun GO Panca and in one of the biggest newspapers in East Java. Before even reading the content, just from the look of the ad, I've been interested. It’s a nice car viewed from all sides, I said to myself. Then when began to read the specifications, gee, I was even more interested, and especially when I saw the On The Road price (for Jakarta area at the time), I was thinking, when will this good car be available in Jember? Finally, just like a Javanese saying, “If it was mean to be yours, it would not run anywhere”. I remembered clearly, on October 2014, I happened to be at a famous hotel in Jember; being part of the wedding committee of a relative. When the stream of guests died down, I sneaked out to to take a break. Right in front of the hotel there were a well-known supermarket, I went there to quench the thirst with a soft drink. When I was about to enter the supermarket parking lot, I saw that there were some automotive products being displayed. My eyes went immediately to the famous car brand product, namely Datsun. Datsun GO Panca T-Option was on display, and it felt as if an electricity current ran through me; the car looked familiar. I immediately thought of the newspaper advertisement from one year before. Without thinking, I called my wife to come to the location. After my wife came, I immediately took a flyer on the windshield of the Datsun and my called the number written on it. Thank God, the salesperson answered it right away, and I was invited to do a test drive at the nearest NISSAN dealer. Prior to that, I called all my extended family to join the test drive (they might recruit me as a salesman as well, hahahahaha). Upon entrance to NISSAN dealer gate, we were immediately greeted by a security guard, who then ushered us to meet the salesperson I called earlier. He described Datsun GO Panca & specifications, I checked the exterior and interior, then I took the test drive. My whole family was also given the opportunity to test drive, hehehehehe. And right that moment, I made up my mind to buy Datsun GO Panca T-Option (with installments of course; the beauty of being a lowly employee) and the administration will be taken care of the next day. 3 Sleepless Nights To Look After The Sun. February 8, 2015. A heavy rain fell upon Jakarta, particularly around my house. Initially I was not worried, even though the water had started to flood the streets. But the rain grew heavier and heavier, and the water level rose rapidly. I took the initiative to call Dad, asking him to go home, in case the water was getting higher. Two hours later, because he had to pick up my brother at school first and it had started flooding everywhere, Dad finally got home. Then he immediately started the car to change the parking position, so it could be raised easily with a jack. Afterwards, Dad and my brother started to jack up the car and propped it with 10cm-thick Hebel (soft bricks). Eventually we managed to lift and prop all four tires with Hebel bricks. Rain continued to fall, and the water was getting higher. If previously the water was under the Hebel bricks, now the water has touched the alloy wheels of the car. Worried that the water might rise even higher, we decided to add another layer of Hebel bricks under each tire. Until afternoon, the rain was still pouring. We were anxious because we didn’t have any Hebel brick left, so we went to a building material store to buy some more. We jacked up the car again and added one more layer of Hebel bricks. Fearing that the car would drift away in the water, my father bound the rear tire with a rope to a house column. That night, our family slept in our shop which was higher and flood-free. But until late at night, Dad still could not sleep as he was worried about the car. Alarmingly, it was still raining, though not as heavy as before. At dawn, Dad woke me and my brother up to stand by; the water has touched the tires. But until morning, the water has not touched the alloy wheels. Around 8 am, the rain began to fall with moderate intensity. Dad was getting more and more worried; he was aware of the danger if we raise the car higher. But in order to save our Sun, Dad was willing to take the risk. 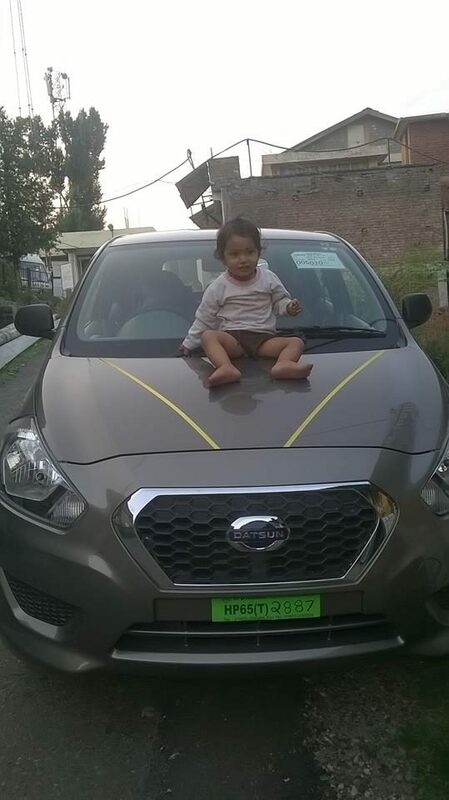 Datsun GO Panca hatchback was my small family’s first car. We picked white color, just as my son Arka’s request, and the letters were under my wife’s name. The purpose was to motivate her to learn driving, but she was still discouraged. 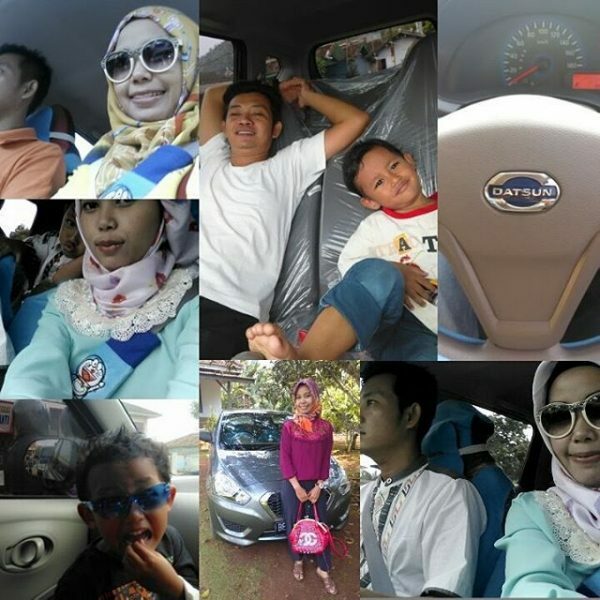 The exciting story of my little family and Datsun happened during Lebaran 2015 holiday. For the first time, we took Datsun on a long trip to my hometown in Surabaya. Although many people had doubts that an LCGC car could do long trips, after Surabaya we planned to go to Malang, continued with Wonogiri (the hometown of my late father-in-law) then off to Jogja. We departed on 6 am, Lebaran day 2, and thankfully we didn’t get stuck in traffic. We exited Cipali toll road around 10 am. We stopped at Nissan-Datsun rest area which was really cool; from comfy sofa to massage chairs, and cold drinks and noodle cups were also provided. Surprisinglya, because my wife and I uploaded a photo of us in the Nissan-Datsun rest area, we got two power banks for free. Our car was also checked by a mechanic. From Jakarta to Surabaya, the total fuel consumption costed only Rp 450,000 of PERTAMAX. It was true that Datsun has been proven economical. From Surabaya, we went to Malang. Datsun’s spacious trunk could accommodate two suitcases, equipments, boxes of apple cider, it was awesome. The super exciting adventure with Datsun happened during our journey back to Jakarta. 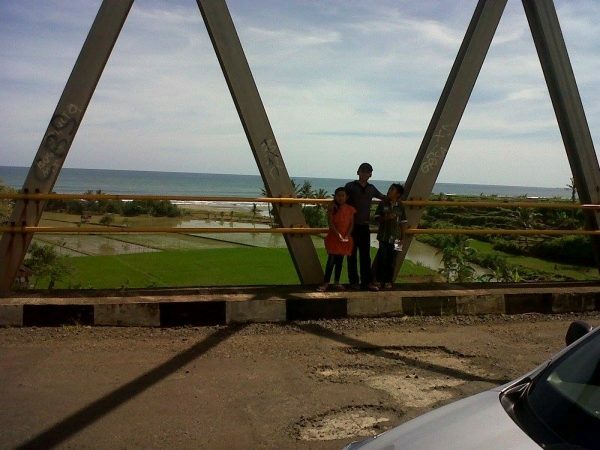 From Malang, we were headed to Wonogiri via Pacitan through the South Coast strip, as we were curious about the beach. We stopped by in Blitar to visit the grave of Bung Karno, Indonesia’sfirst president. At 1 pm we continued the journey following a map app, as we’ve never took the road via Pacitan before. The map turned out to be inaccurate because of poor signal reception, and we got lost in Trenggalek. Rocky roads, sharp bends, steep slopes. On our right side was a cliff, on the left side a chasm. The road was just wide enough for two cars. We lost count on how many times we stopped to ask for directions. Houses were sparse; there was no other cars aside from trucks carrying wood or straw. We felt even more anxious as the gas was running out, the road had not leveled off, and no other people. My wife started to panic because it was almost dusk; she feared being in the dark, in the middle of nowhere, with empty gas tank. #datsunstories_in When I first looked at the GO+, it merely looked like the my dream car which isn't surprising since the two share their platform. With a similar 'D-cut grille', wrap-around head-lamps and the bumper housing three lower air intakes, the front-fascia of the car looks pretty good. Before that i was looking a car like this one and i searched all the cars. After its first look its cost its interior design its millage every thing was fulfilling my aspects. After a deep research I decided to buy this car without any delay, its well saying that where is a will there is a way so on the same day I came to know that Datsun Go+ has started booking in my city, without any delay i went to there and book this car with a minimal amount and same day I approached to a bank for car loan and get within a three days. 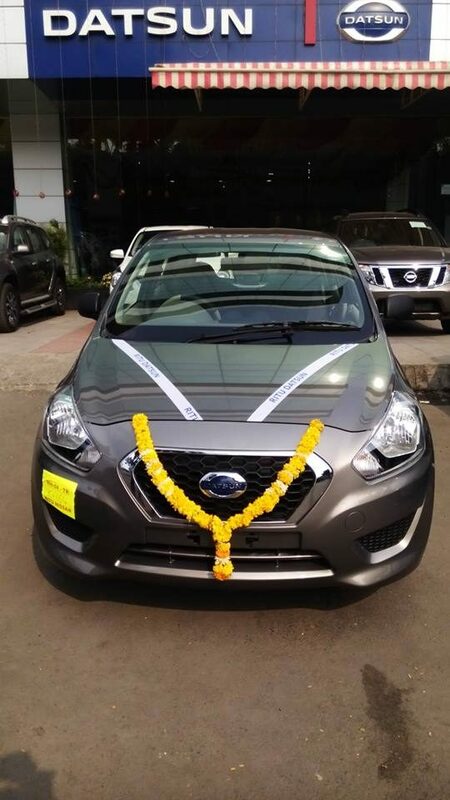 It was very pleasure and a memorable experience at the show room of Datsun Go+ , the ambiance and the attitude of the whole staff was very cooperative and high level of satisfaction. I got the car within a few hours after the document procedure. It was also a memorable moment to take key of my first dream car. Now i was very exited for my first ride with this car . I was really very happy and feeling awesome in my first drive. When I reached in my city with this car so many people came to me to saw this one because i was the first person form that city who bought this car.I got a world class after sale services at its show rooms. 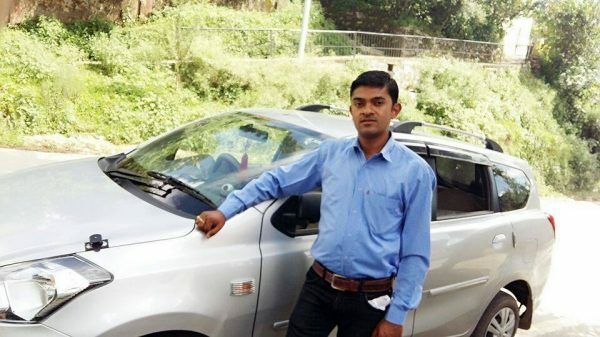 Now I am going to complete one year with this car and I can say with a great confidence that its a nice car with all features in this price range. I thanks to Datsun Go+. Hello, my name is Arie Sastro. I came from a small village in Batang area, Blado district, in Jono village, to be exact. Since childhood, I had a dream and aspiration to be one of those people who had everything. Such as a family, a house, and of course a car. I grew up in my grandmother's house in Sragen since the age of four. That was where I got introduced and educated to the automotive and modification world by an uncle. Growing up, my hobby and creative ideas emerged, fueled by the surrounding environment and my personal development. When I began a family, I've got a Honda LX 89 car, which I traded for a Timor 99, both are secondhand. With that car, I began to pour my creative ideas in the automotive world, but later I started thinking to combine my modification concepts with business. I started planning, looking for a potential market and analyzing which car would be a popular and a family favorite; then I sold my last car Timor and started looking for a more suitable car for my passion and my family. One by one, I tested every LCGC car in the market... from A, B, C, I tried them all. Incidentally my business was in interior and exterior modifications, so many of my customers came with an LCGC car. Considering my hobby, when testing an LCGC, the first consideration was the shape and comfort. I did not like because I didn’t think that car would be a good fit for my family and my hobby. After searching on the internet for quite some time, there was this one LCGC who was not launched yet, called Datsun . I tried to wait and got curious. And at the end of my wits, when I started to have doubts, I get a BC from a Nissan Tegal marketing named Yudistira on July 13th, 2014. 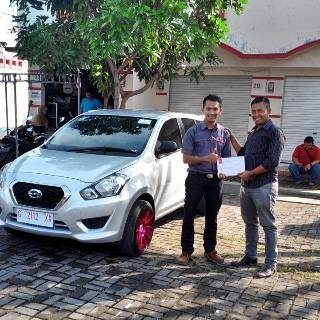 I vividly recall the sentence, "Datsun Go Panca is now ready in Tegal, you can test drive tomorrow, contact me." It was around 13.30 pm. Without even thinking, I called him immediately. And my first time riding a Datsun Go Panca was on July 14th. Datsun was the first car that we owned. At first, having a vehicle was not an urgent need to us. It had never crossed our mind to buy a brand new car straight from the showroom. It seemed impossible that we would do that in the near future. Once in a traffic jam, I saw a car delivery truck, ready to bring the new car to the buyer. At that time, I said to myself; ""Will we ever be able to afford a brand new car?"" It was just a passing thought. However, my husband business required him to distribute coffee products into tourist centers and minimarkets in Bengkulu. After much thought, consideration and asking for people’s opinion, finally we decided to look for a 4-wheel vehicle that would help my husband’s business, and also to take our family to enjoy the Bengkulu city. One day, we saw a new Nissan-Datsun showroom was opening soon in our town. We were impressed to see the huge building; they must’ve had a large market here. Still, it didn’t occur to us to go there, because we were not considering to buy a new car. In our mind, we were going to buy a used car. 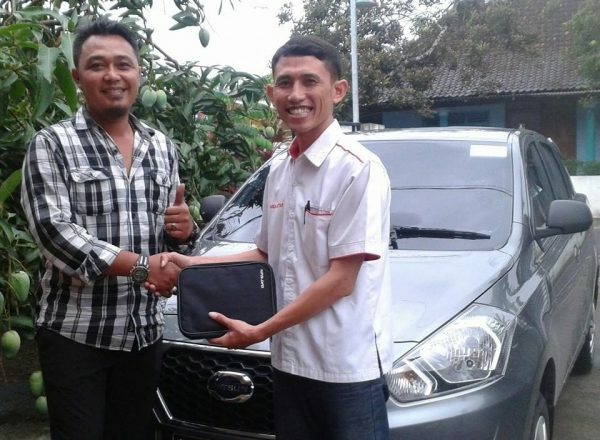 After spending som time searching for a used car, we met a friend who happened to work at Nissan-Datsun Bengkulu. Actually he didn’t intend to sell us his products, but after chatting for I while, I casually asked the price and specification of Datsun cars. Then he explained it in detail. That was how we became intrigued with Datsun. The next day, I looked up for information about Datsun on the internet. I printed it, highlighted some important points, then discussed it with my husband. Then we braced ourselves to go to the showroom, with the excuse of meeting our friend. Next thing, we were checking out the Datsun car while asking for a brochure and price list. ‘Amazed’ was a word that might describe our feelings at the time. An elegant car with a very reasonable price. Seeing our enthusiasm, our friend offered to do a test drive. Without a second thought, we took the offer. When we got inside the car, the urge to buy the car was getting bigger. We felt comfortable. The capacity was large enough to support my husband’s business in marketing our product. We were even more convinced kno wing that the car was a government-backed LCGC. Shortly, we went back to the showroom to reserve a unit. I still couldn’t believe that we have visited a showroom. We even took selfies inside the showroom (how tacky of us, lol). Until finally we paid the down payment, and our Datsun Blackies arrived safely. Thank God, maybe at the time I was daydreaming about having a brand new car, an angel heard it. Hihihi... The GoPlus is now always ready take my husband delivering products, and also to take our family to spend time together. We always feel comfortable and safein our new car which is inexpensive, but not a cheapo. Thank you, Datsun! This is my #ceritadatsun, where is yours? My wife and I had been wanting to have our own car, at a price we can afford. We did lots of research on different types of cars in our price range, with their pros and cons. One of them is Ayla, which we had tested driving around our neighborhood. After some considerations, we finally decided not to buy Ayla. A few days later, my brother informed us about a Datsun dealer in Malang. For your information, we live in the Lodoyo/Sutojayan area, Blitar. We were told, Datsun was an old brand which had been reborn. On December 13, 2014 we went to Malang with the sole purpose to see Datsun. At the Datsun dealer, we met one of the sales, who chatted with us and informed us about the pros and cons of Datsun. Once we’ve got enough info, we were offered to test drive the car to around the town, although only for about fifteen minutes. After the test drive, we fell in love with Datsun. With the engine capacity of 1200 cc, it was different from other LCGC brands. Datsun felt more powerful, more solid, and there were a 7-seater option (5 + 2) with the Datsun GO+ Panca type. That very day, we agreed to purchase a Datsun GO+ Panca in grey color. Thank God, nine days later, on December 22, 2014 to be exact, the car arrived at our house. We called our new family member Si Encun or GoGrey. From that day on, GoGrey was taking us everywhere. GoGrey’s first long journey was on December 27, 2014, when our family went to Batu, Malang for a family gathering with my in-laws. The distance from Lodoyo to Batu was about 80 km (160 km return trip), with many twists and turns, ups and downs through the East side of Kelud mountain and the West side of Kawi mountain. Through the hills in Ngantang, Pujon, Panderman mountain and ended in Songgoriti Batu area. The next long trip was when we were going mudik to our parents and relatives in Rembang, Central Java, in mid-March 2015. The route was Blitar-Kediri-Nganjuk Ngawi-Cepu-Blora-Sulang/Rembang. We had our concerns, because in the previous mudik events we always drove a diesel-engined car; an Izusu Panther ‘94 that we used to call ""Tiger"", and sometimes a motorbike. This was our first time using petrol-fueled car. Surprisingly, our mudik journey with my wife, Anandayu Widdy Dewanti and our beloved daughter Azkiya/Chacha was so much fun. During our stay in my hometown (Jatimudo Village, Sulang District, Rembang) we made time to drive around town with my parents, nephews and other relatives with GoGrey. It was a nice experience, although only for a few days. I have purchased my Datsun go +T in month of June 2015. Before purchase this car lots of people said to me that don't purchase this car because its new company entered in market and the material used in this cat is very poor quality and there are few services provider for this car in India but I have seen the pictures and features of this on internet and decide to purchase this car and even you can not believe that I have booked this car without test drive and without physical inspection I have transferred initial money to the distributor's bank account and within one week I have purchased this car. After that many people see my brand new Datsun go +T car and give me compliment with "WOW" what a car and said to those people that " its not just car, Its called caaaaaaaar". Some people take test drive with my Datsun go +T and after that within next two weeks four new costumers purchased " Datsun go +T". I and they all are very happy to purchase this car. I really thankful to company for introducing such a wonderful dream car in cheap and reasonable price in India. Also I want to give congratulations to company for upcoming brand new Datsun GO DO. Also I want to share one another thing that the First and Second gear of this car is very very powerful because of I belong to the hill area of Himachal Pradesh, India and feel that both gears are very useful, friendly for hill areas. Again I heartily thankful to Datsun Company and feel proud to be a part of 100000 Datsun costumers. Hi I am Lokesh Sharma from Agra , India . Recently I have taken my Dream car Datsun go at my home. First when I was planning to buy car I searched many different company's Car . But when I compared Datsun with many cars with this Prince range , Datsun was on the top. Specification of datsan go was amazing among different company's cars. When I take it home many of my Friends guessed that it is a costly car like 6 to 7 lac. Thx Datsun for affordable Price for medium range. Looking of this car so good both interior or exteriors . It is my first car . Thank you for datsun for give me the best in best Price. On May 2015 I bought my new car after a long consideration, recommendations from friends, surveys on the internet, references from automotive magazines, and finally a test drive at the Nissan-Datsun Gorontalo dealership. 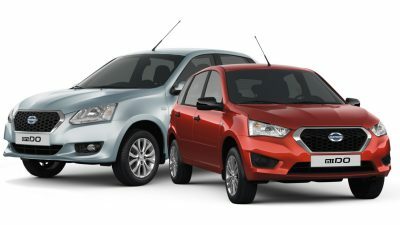 I decided to go with Datsun GO+ Panca with its pros and cons. 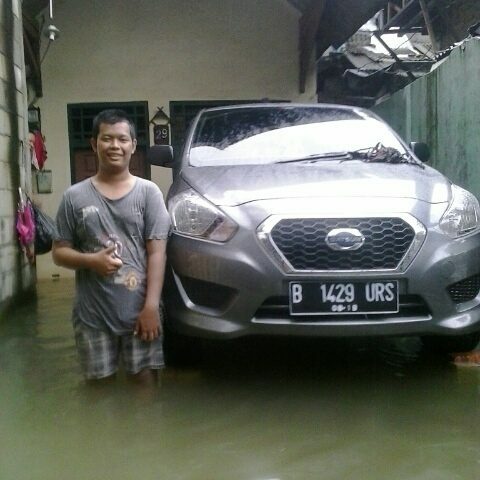 I purchased the car at Nissan-Datsun Gorontalo in installments, I had been saving for years from my salary, and my wife also helped. Finally my dream car was here, and I named it The White. I strolled along with my Datsun, which was supposedly the most in-demand car brand at the 70s era in Sulawesi; including in Gorontalo circa the copra harvest heyday. 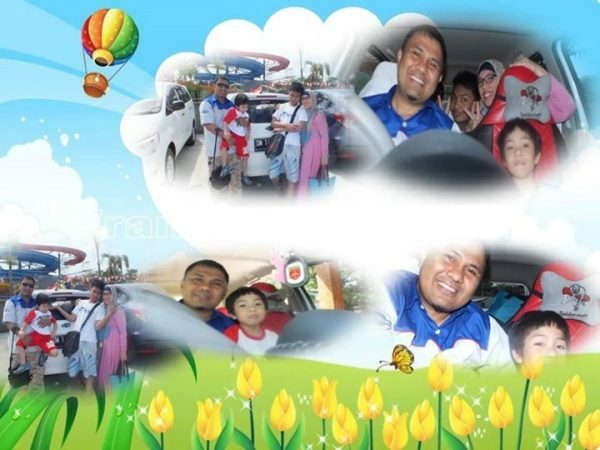 My white Datsun GO+ Panca drove around Gorontalo city streets in a joyful atmosphere; my children were happy to be riding a new car while enjoying the view outside and the music in the car. Well, it turned out the car’s air conditioning was really cool, the cabin was roomy,with spacious trunk. It was the absolutely ideal family car, as it could accommodate 7 people. Moreover, it was fuel-saving and environmentally friendly, just like the ad said, and the luxurious interior felt like a sporty car. One day, we drove the White Datsun at high speed toward the Waterboom Planet Gorontalo attraction. The funny thing was, when I parked there, many people glanced and asked, what brand was this cool and sporty car? I just smiled and said, Datsun Go. They examined my car and took pictures of it with delight. After finished playing at the Waterboom Planet Gorontalo, my family drove along in the sporty White Datsun once again, this time towards my house. To be honest, before deciding on this car, just like many other people who were planning to buy their first car, we reviewed many other car variants. The ones within our budget, of course. We were considering A*ya, A*la, and also B*io; all of them were interesting… But apparently when choosing a car, ‘love at first sight’ also applies. :) Yes, that was what we - my wife and I - felt when by coincidence we saw Datsun GO+ Panca being displayed in one of the famous supermarkets at Gaplek-Pamulang intersection, South Tangerang. To us, the car was special because of its proportional size, with modern and dynamic body shape, plus a spacious cabin housing three rows of passenger seats. For a car which was classified as an LCGC (Low Cost Green Car), this car was more than adequate; it could even be called a semi-MPV (Multi Purpose Vehicle, which was one class above.) All of these advantages made both me and my wife fall in love with it; but instead of being jealous of each other, we were becoming closer than ever. Ooh, so sweet. Finally, after recalculating our budget (which turned out to be safe), around the end of March, we visited one of the showrooms in TB Simatupang area. Long story short, on that day we booked the car, on the 4th week of April we paid the down payment, and finally in May 6, 2015 the car of our dreams - which we named Maya - arrived at her new home, and officially became a precious member of our family. Once in a traffic jam, I saw a car delivery truck, ready to bring the new car to the buyer. At that time, I said to myself; "Will we ever be able to afford a brand new car?" It was just a passing thought. I was not born with a silver spoon in my mouth. It was an English saying which means than I was not born from rich parents. That's me… Growing up in modesty until I became a teenager, and then an adult. Until the word ‘modest’ had become my philosophy and my way of life. I got my Diploma in 2004, finishing up my job commitment of 5 years up to 2009, and eventually resigned and started my own business in early 2013. I’ve always tried to think simple, setting my goals, and then GO .. going forward with all of my strength. 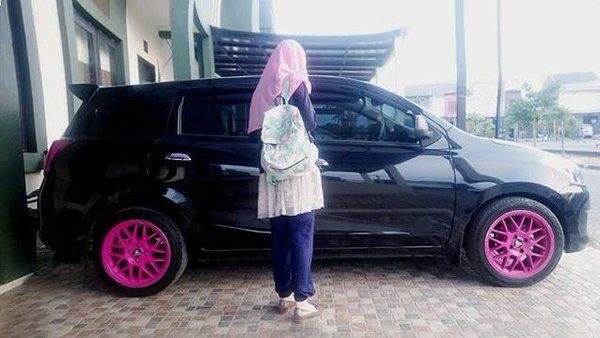 It once unimaginable to me during my teenager years, to have my own car. I was just struggling to GO, passing through every obstacles, and live my life happily. 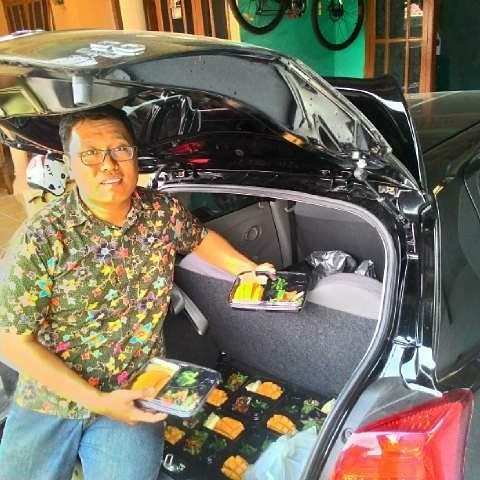 I started running my business with a small box truck; it had not occurred in my mind to have a family car... Until there was an LCGC car program in Indonesia. I saw an ad for Datsun GO Panca; I remembered the tagline,"The vehicle which makes you GO right away." It caught my attention, but not enough to make me want to have it. A few months later, due to the increasing need of my family, and also the availability of some money for down payment, I was thinking to GO buy a passenger vehicle. Collecting brochures of LCGC cars, joining a forum for LCGC owners, to visiting official sites of LCGC cars, had become my leisure time activities. 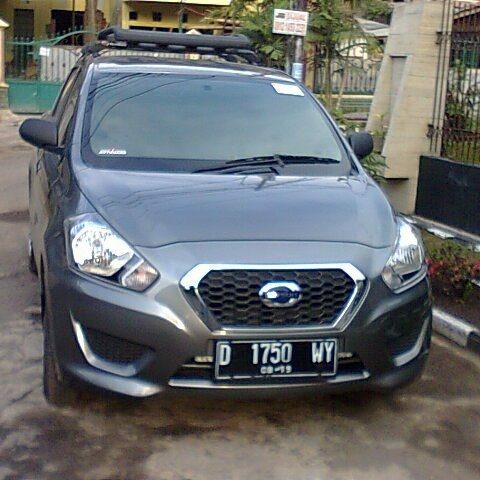 Until finally in March 2015, I decided that Datsun GO panca was the best option for me. "GO, Powerful On Every Steep Ramp"
The journey begins. Our first intention was to protect the children from the weather, both hot and rainy, so they could go to school comfortably. Then when I went to one of the malls in Jember, I was handed a car flyer. I took it home. On it, the salesperson had listed his name and contact number, as well as his BBM PIN. I invited him for a chat; casually asking about the car (although we didn’t have the budget yet). In a friendly and polite way, he explained about the Datsun cars and mentioned several offers. I was quite interested, but because I haven’t consulted my husband yet at that time, I didn’t pursue it seriously. A few days later, friend asked me to go with her to another car brand’s dealer, to look around and test drive. I agreed to tag along, but on the way I told her about the Datsun brochure I got at the Mall. Finally we changed direction into a Nissan-Datsun dealer. When we got there, we immediately looked around for the cars in the brochure. It turned out, the salesman I chatted with was also there. “Ma’am, this is the car that I offered to you," he said. Maybe it was meant to be. We were invited to do a test drive, but unfortunately I couldn’t drive and didn’t have a license. So my friend took the offer, accompanied by the salesman. 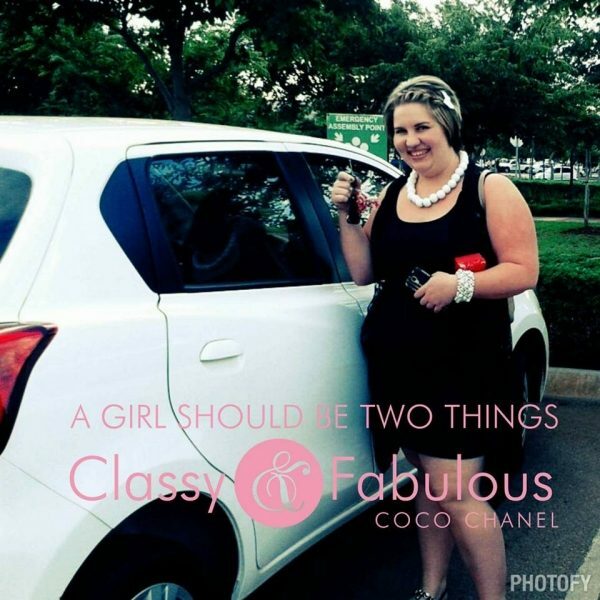 I trusted her judgement, because she had experiences with a variety of cars, so she surely knew better. On the way home, I called my husband and told him about my experience, including the details about Datsun car. Thankfully, God blessed our family, so we were able to buy one unit of Datsun GO+ Panca in white color. But apparently we still had to wait for about two weeks until the car was available. During that time, I took a private driving lesson for a week and also the test to get a license. It was nice to see my wife and children could sit back and sleep in the car. Datsun was our first car, as previously we were always traveling by motorcycle. My wife and I opened a shop. Whenever I had to go shopping to replenish the stock, my wife and children would tag along. Because I always bought quite a lot of goods, I installed a bag on each side of the bike, just like the one in a postman’s bike. We had to travel quite far; a 2.5 hour journey. The road was bumpy with a lot of potholes, and when it rained, we need to be extra careful. When we saw the Datsun commercial on TV, I was immediately interested and determined to have it one day, so that my wife and children wouldn’t have to suffer from heat and rain again. We started saving to realize our dream of buying a Datsun car. Thank God, our dream came true, and we are now the proud owners of a Datsun car. We chose Datsun GO+ Panca type T-Option, because the third row bench could be folded and turned into a vast baggage room to carry goods. Thanks Datsun, my wife and children are now very happy, as they can sit and sleep comfortably during the trip. I’m Nicho Bj. This is my first car. The story was quite unique. I bought this car a week after my wedding.Initially I was hesitant to buy this car, because quite frankly our budget was limited. We consider this car as a gift for our 1-week marriage.